F55F Championship raised $40,000 for Childcan. Photo: Jeffrey Reed/LondonOntarioGolf.com. Ed. 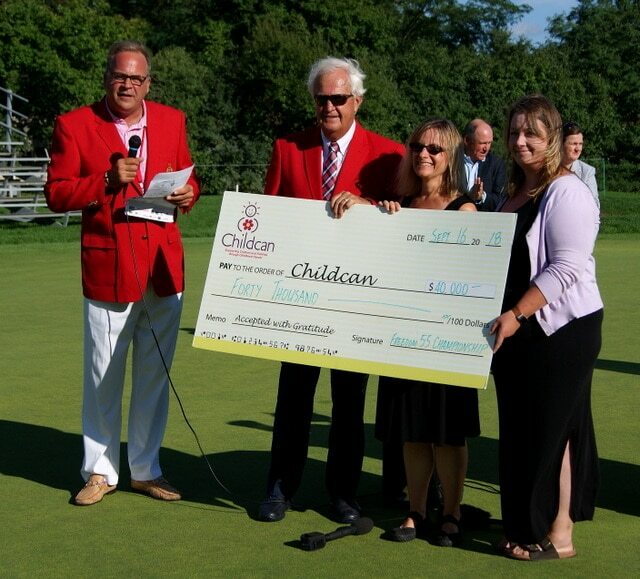 Note: The 2018 Freedom 55 Financial Championship at Highland Country Club in London raised $40,000 for Childcan. Read our story here. The Canucks for Kids Fund supports a variety of charities related to children’s health and wellness, grassroots hockey and education. Funds were primarily devoted to Canuck Place Children’s Hospice, the Canucks Autism Network and BC Children’s Hospital. The Children’s Health Foundation delivers programs that specifically target early intervention, child and youth mental health and access to care no matter how rural or remote a child is located. Funding supports Foundry Victoria, a clinic where youth can get help for physical, mental-health and addictions issues. Money goes towards advancing cancer research and enhancing care for patients throughout B.C. Founded in 1910, Lethbridge Family Services is a leading agency in the social and health services sector and community health services throughout southwestern Alberta. Their emphasis is on community collaboration. The Hospice Village serves patients and their families dealing with life-altering diagnosis. This means that Hospice services are available to patients and their families from pre-diagnosis to bereavement. Funds go to ensuring that the Hospice can continue to provide services at no cost to patients and families. Credit Valley Conservation protects, restores and enhances the natural environment of the Credit River Watershed. The Bethell Hospice is the only residential hospice serving all of Caledon, Brampton and Dufferin County. Caledon Community Services focuses on community building, especially in Senior’s Health and Wellness, Employment, Business Development, Specialized Transportation, Youth Training, Poverty Reduction and Resettlement Services. Funds raised go towards the continued development of the Glenrose Rehabilitation Hospital. Fund went towards the support of amateur and grassroots football in Calgary and southern Alberta communities. Gives financial assistance to skilled, trade students who wouldn’t otherwise have the opportunity via the Princess Auto Foundation. Also provided funds via the “Birdies for Kids Program” to the Children’s Hospital. Funds also supported the Golf Mentorship Foundation, a junior mentorship golf camp in Winnipeg. Funds supported the Healing More Better Campaign, focusing on state-of-the-art research to not only heal more children, but to do so with as few after-effects as possible. Raised funds for childhood cancer in order to support research and provide responsive and compassionate programs and services to families facing the journey through childhood cancer, from diagnosis through treatment, to recovery or bereavement.